Sennen was as good I've seen it for months today. Fairly heavy, super-clean, bright sunshine, decent banks and head high swell (much bigger at Gwenver). I paddled out with Harry, somewhat tentatively because all this surfing (I've been in the water six out of the past seven days) is regrettably rather alien to me, what my catalogue of medical woe. My upper back and neck are rebelling against this unusual bout of exercise, not in a way that makes me fear that cervical myelopathy is back in business, but more because muscles that haven't been used for ages are getting a serious work out. In short, everything is bunched up, tight and painful. This, along with having a metal cage in my neck, makes me a very conservative surfer these days. I am not the bloke hassling for waves, paddling on the inside, snaking and dropping in. As such, it's really, really, REALLY annoying when someone drops in on me - as done by a certain surfer today. This individual gets his fair share of waves. He'd had plenty already by the time I paddled out. I hadn't had any, taking it easy and waiting for the right one, and then bang, along it came. It was a lovely, glistening right hander of about shoulder height. I was in prime position. I had priority. I paddled and knew I had the wave. But so did this bloke, about two yards to my right. Did he drop in? Yes, dear readers, he did. He was so close to me that there was no point in going for the wave: there wouldn't have been room even to trail in his wake. I think this little act was out of order. When matey paddled back out, past me to the peak (yes), I refrained from saying anything. I am, after all, a mellow chap these days. But my mood and my surf was ruined. I mean, it's not as if I'm some kind of line-up terrorist, paddling frantically from peak to peak, ruthlessly dropping in on all and sundry. I take it really easy in the water. I wait for waves that won't, I earnestly hope and pray, destroy my neck, and I keep out of other surfers' way. It's obvious that I'm not an aggro guy when out there. It's probably obvious, too, that I struggle with a dodgy neck (I can't raise it very far from the board when paddling). So why drop in on me? Why f*** up the one decent wave that comes my way? If you drive a black retro vehicle, ride a longboard and surf regularly at Sennen, can you please drop in on someone else next time? Astonishing scenes! I write having surfed for the past four days in a row, without sustaining any kind of injury. I have been free of killer bungee cords, immune from broken ribs and, touch wood, strong of neck. And better yet, there have been waves. This evening, especially, the dropping tide at Sennen Cove yielded mellow chest to head high rollers and just a handful of locals. Bliss. Before that, Friday, Saturday and Sunday were all good, though a tad too crowded for my liking. The charts suggest that this early autumn surf fest is set to continue. I hope so, though I'll continue to be the one with the lowest wave count per session. When you have a metal neck, you tend to take it easy rather than paddle for everything. Last week I checked out Soul Surfer, the film which recounts Bethany Hamilton's incredible recovery from a shark attack to surf again, not just competently but brilliantly. Bethany's left arm was ripped off by a tiger shark while surfing Tunnels, a break near her home on Kauai, six years ago. That kind of thing would have done for most of us but not this lady. Within a month, she was back in the water relearning how to surf, adapting both her pop up and duck dive. Just a few more months and Bethany was competing again. She went on to rise through the ranks of the women's ASP Tour and has even tow-surfed Jaws. I interviewed Bethany at the Lighthouse Cinema before seeing the film. I wasn't sure what to expect - after all, Soul Surfer is a Disney production and it would have been no surprise if Bethany, who's played by AnnaSophia Robb in the film, had been attended by a phalanx of PRs and hangers-on who monitored her every word. Not a bit of it. Over a one on one interview Bethany was generous with her time and thoughts, engaging and engaged. She'd been for a surf at Fistral earlier, and, it transpired, seemed to have inspired half the film's cast to take up the sport, Dennis Quaid most notably among them. "He was always asking what the surf was like," recalled Bethany, with a smile. The interview will be published in a forthcoming issue of Huck magazine, as will a feature on my experience of the World Bellyboarding Championships, held at the beginning of September at Chapel Porth. Check 'em out, and please tune into this blog regularly from now on: having at last, I hope, reached an accord with cervical myelopathy, with a neck that's in order at present, I aim to return - sensibly, mind - to surfing, and so will start writing of this and that from the surf world again. This resolve also chimes with a few surf-related projects that have come my way, of which more anon. Meanwhile, despite a fair level of cheesiness, and some continuity flaws in the surf scenes (a crucial contest is replete with surfers who take off on lefts, only to be intercut with footage of them going right, and vice versa), I heartily commend Soul Surfer. Bethany's story is simply amazing. You can't fail to be inspired, and I can't fail to be mortified, for this evening, post Sennen surf, I alleged, to my surfing comrade Allie, that it was wrong to describe the Cove and the north shore of Oahu as 'indiscernible'. What?? I hear Andy Martin jumping for joy, for have I at last conceded that Hawaiian waves are better than British ones? No, I could never do that. Awash with salt water after four days' surfing, I momentarily felt that 'indiscernible' should be replaced by 'indissoluble'. Thus Allie would have said: "Alex, my good man, it was nice to see you back in the water. Mick and I have got a sweepstake running on your next injury but fair's fair, tonight you emerged unscathed. Well done. And the surf was good too. Your lad Harry was mad to paddle out just after the tide turned, we all knew the surf would be rubbish then and no wonder he had a rubbish surf. But when we paddled out, why, it was as if Sennen Cove and the north shore of Oahu were indissoluble." Allie, forgive me. 'Indiscernible' would have done just as well. And anyone who says otherwise is a fool. Here I am again, with all kinds of news. First up, thanks to Neil Watson for some fantastic skate footage from Watergate Bay's old skate bowl. The clip below is on YouTube and features Nigel Semmens and Steve Daniel, legends of UK surfing both, among others. Brings back memories of skate bowls up and down the land from 1970s and into the 80s. They don't make 'em like that anymore. Have we lost something? Next, QPR. We are world class. I've seen a couple of games this season but sadly wasn't at yesterday's destruction of Wolves. My £10 at 1,500-1 for the Premier League title looks to be very good value (and Joey Barton is a force for good. Honest.). More news. I have resigned from Cornwall Today. As this blog's loyal readers, as well as sundry Cornish folk, know, I edited CT from July 2010, while Kirstie Newton was on maternity leave. Kirstie returned a couple of months ago and we had been co-editing the magazine in a job-share, but after some long and hard thinking I felt it was time to move on. I'm there for another few weeks but then it's back to the freelance fray for me. To do what? I'm glad you asked. I'm going to be writing a book for John Wiley called, provisionally, Amazing Surfing Stories. It'll be a retelling of well-known surfing tales but there will also be plenty of new and interesting material. 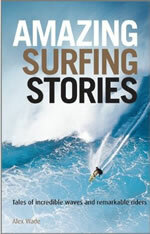 If you have a surfing story that you think is amazing, drop me a line at alex@alexwade.com or post a comment here. I'll also be finishing my novel and working on another non-fiction book about the law. I may well pop up somewhere in the surf industry, too, but more of that if and when it happens. And, of course, I'll be freelancing here, there and everywhere (including for Cornwall Today; my departure from CT Towers is entirely amicable). Have I been surfing? No. My titanium-filled neck has been a bit dodgy again and I've taken the view that discretion is the better course of valour. I enjoyed getting smashed around at Chapel Porth in the World Bellyboarding Championships but haven't stood on a board for a month or so. Hopefully my neck will settle down and I'll paddle out for a few rides again soon. Lastly, I bumped into a lady I know only as Dr Sarah last night while buying red kidney beans in Tesco, PZ. Yes, the excitement never stops round here. Anyway, Sarah is an excellent person and a Sennen/Gwenver surfer, too (she is also a Doctor). We got talking about a session at Gwenver of some two or maybe three years ago. It was a summer evening, the sea was oily and basking sharks were some 100 yards or so beyond the line-up. Extraordinarily, despite there being lovely, languorous lines stretching to the horizon, no one, save a couple of beginners on the inside, but Sarah and I were in the water. The left was serving up delicious chest high rides all the way to the beach. Sarah and I took turns on the peak, catching waves to the shore and paddling back out, for over an hour. The air was so still, the light so soft; the waves just kept rolling in, bearing us shorewards and allowing for carves and turns of grace and poise. To this day, I count it as one of my best ever surf sessions, and so does Sarah. The thing is, despite barely knowing each other, Sarah and I shared that experience. Only we can truly understand it, though, of course, every surfer will have had something similar. That's one of the many beauties of surfing. You can hardly know someone, and yet have something blissful in common.